Education technology blogs and podcasts can be excellent resources for teachers who are interested in implementing technology into their classrooms or lesson plans. Here are 15 blogs and podcasts that almost any teacher can learn from. iLearn Technology - The iLearn Technology blog is hosted by an elementary teacher that writes about integrating technology in the classroom. Posts include reviews for tech tools and tips on tech implementation. Free Technology for Teachers - Richard Byrne writes about free tech resources and how to use them in this popular education technology blog. The Ed Techie - Martin Weller, a Professor of Educational Technology at the UK's Open University, hosts this education technology blog. Posts focus on elearning, web 2.0 resources, technology integration, and similar topics. The Innovative Educator - The Innovative Educator blog addresses teachers who are interested in educating innovatively. The blog has a companion wiki, Twitter feed, and social network. TL Advisor Blog - This blog from Tech & Learning features posts from a large group of teaching professionals who share information about education technology. Teaching All Students - This blog from Patrick Black focuses on assistive technology in the special education classroom. 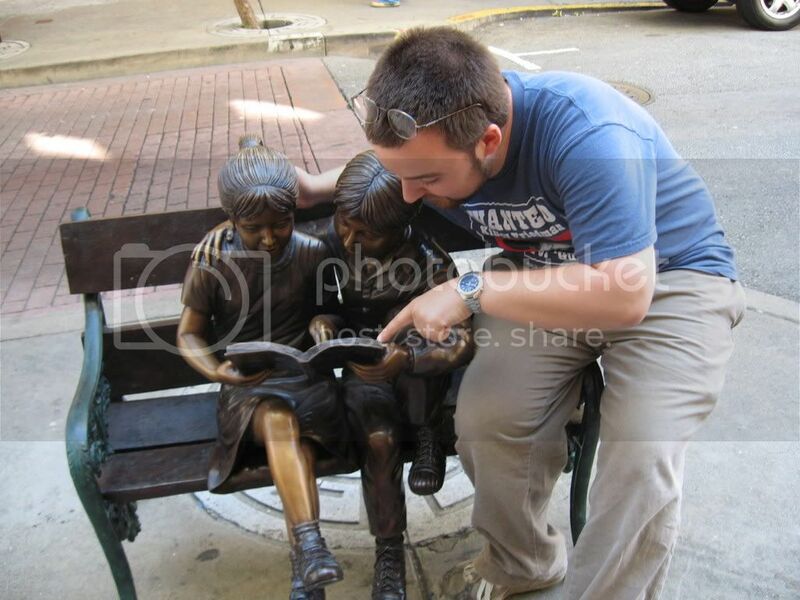 Patrick blogs frequently about tech tools and how they can be integrated into lesson plans. Classroom 2.0 - This online social network was created for teachers and other educators who are interested in implementing web 2.0 technologies in the classroom. Members blog frequently on a wide range of ed tech topics. NextGen Teachers - NextGen Teachers is an invitation only community that encourages educators to explore the next generation of teaching and learning. Blog posts include information about tech tools, blogging, conferences, and workshops. On Blogging and Social Media - This blog from Nik Peachy is dedicated to helping teachers and other educators explore blogging and social media. Nik also offers a free ebook with web 2.0 tools for teachers. Teachers Teaching Teachers - This weekly webcast explores the most effective practices in technology. Teachers can join the live webcast each Wednesday at 9:00 p.m. EST. EdTechWeekly - EdTechWeekly is a weekly podcast that shares the latest news from the education technology community. Episodes also feature useful tools and tips on integrating technology in the classroom. The Teacher's Podcast - Mark Gura and Dr. Kathy King, a popular podcasting team, host this teacher's podcast. Episodes focus mainly on ed tech resources and professional learning. TILT - TILT (Teachers Improving Learning with Technology) is a teacher-created vidcast that explores technology in education. The vidcast welcomes text, links, audio recordings, and video recordings from other teachers. It's Elementary - It's Elementary is an EdTechTalk podcast that focuses on education technology in the K-6 classroom. Geek!Ed! - Produced by five self-described geeks from a school district in Michigan, this (mostly) weekly podcast explores the impact of technology in education. Guest post from education writer Karen Schweitzer. Karen is the About.com Guide to Business School. She also writes about online school for OnlineSchool.net. Read more about the project here, then email your entries to teachforever AT gmail DOT com. Hi! I'm writing to tell you about a cool new program from Chevrolet and Weekly Reader. The companies are partnering with Harvard-Westlake Middle School in Los Angeles to webcast what could end up being one of the world's largest show-and-tells. Teachers and students across the country are being invited to participate remotely via live video webcast as nearly 800 Harvard-Westlake middle school students and teachers learn about the basics of electricity, including why it’s important and how this common energy source can be used to transform the way we drive. With the launch of vehicles like the Chevrolet Volt less than a year away, now is the time for students to learn more about the advanced technologies that are leading us into the future of transportation and what it will mean to them in the future. http://bit.ly/ChevroletVoltSchoolWebcast in order to submit your questions. If you'd rather just watch the streaming webcast, you can do that at http://WeeklyReader.com or http://ChevroletVoltage.com. I realize some of you might be skeptical about exposing your students to a corporate-sponsored event like this, and I certainly share your concerns. Nevertheless, if it's something that will get students excited about science and math and the big possibilities that this technology offers, I think it's worth taking a risk on. If anyone decides to take advantage of this at school, please let me know how it goes. I'm going to try to watch it and report on it as well. Enter To Win 100 SAT/ACT Prep Books For Your School! Author Brian Leaf is giving away a prize package of one hundred copies of his books, including McGraw-Hill's Top 50 Skills for a Top Score and Defining Twilight: Vocabulary Workbook for Unlocking the SAT, ACT, GED, and SSAT. To enter, simply email BrianLeafSATBooks@gmail.com. One entry per person, but everyone from a school may enter. One email will be chosen at random to win. Contest ends January 4th, 2010. In addition, Brian has made part of one of his books, McGraw-Hill's Top 50 Skills for a Top Score: SAT Critical Reading and Writing, available for free download. You can download, print and photocopy, post on your website, or even forward the free pages directly to students' email inboxes. Leaf has committed to being available to college counselors, educational consultants, teachers, and students who have questions about the book or SAT/ACT prep in general. The download is available free at http://www.brianleaf.com/index.php/SAT-Critical-Reading-and-Writing.html. For more info, visit www.BrianLeaf.com. Catch up on recent entries here, and then get writing! There are quite a few weeks left to complete the project (even though there aren't that many weeks left in the year) so we will have to carry into 2010 a little bit. I'm already thinking about another year-long project for next year, and while I have some ideas in mind already, I'm open to suggestions. Email your entries and suggestions for next year to teachforever AT gmail DOT com. Read more about it (including lyrics and more) on the mental_floss Blog. Carnival of Homeschooling: NaNoWriMo Edition - Worth exploring for educators in any venue. 99 Excellent Advice Sites for Teachers - 100 if you count my blog! iplaymathgames.com - My boss tipped me off to these math games using cards and dice designed for Grades 2-3. IPMG Publishing's website contains tons of free, fun activities. If you've been interested in all of the simple number sense games I've been writing about, you'll certainly find a lot of new resources here! Survey Shows Parents Would Rather Talk Drugs Than Science or Math - A good summary and reaction of the report is up on Wired: GeekDad. Find a Way - The always interesting educators at Sup Teach? share another story about how easy and important it is to show students you care. 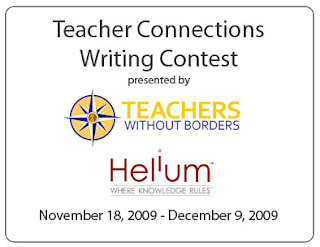 [Just received this great tip via email:] Teachers Without Borders has recently partnered with Helium.com, an online co-op of sorts for writers, to create the “Teacher Connections Writing Contest” which will start on November 18 and end on December 9. All in all we are giving away $400 in prize money to top rated articles written for this contest. The best part is, in the spirit of our mission of connecting teachers with each other, this will be an invaluable resource and outlet for teachers around the globe to share ideas and expertise on subjects close to them and potentially earn money doing it. Click here for more information! And not the crazy scandal kind that make us cringe when we see on TV. It’s about the relationships that we build with co-workers and administration, with students as their mentors and the people shining light on their path toward knowledge. It’s about the relationships we build with parents as we band together to get the students who sometimes act like nincompoops to wake up and realize that there’s more to life than texting and Twilight. As we build positive relationships with those around us – professionally and personally, we start to see change come about. It may be minuscule, but suddenly knowing that the student who’s constantly falling asleep in class is doing so because he was working late to help his mom pay the rent, or the co-worker who’s a bit snappy on Mondays because her weekend really sucked and she’s stressed because her kids just aren’t getting it – for the 3rd or 4th week in a row helps us to respond appropriately – to offer the words of encouragement that help make the world a better place. Then, hopefully because of the relationships we’ve built, when it’s our turn to have a crappy day, someone will notice and lift us up. When it all comes down to it, teaching is just as much about passing knowledge as it is about changing the world one person at a time. As teachers we see so many students come through our doors, and then walk right back out. It’s impossible to think that as an individual you can reach all of them, and I’m not encouraging a martyr complex, “No man is an island,” and without relationships, we’re just rocks in the sea. It’s imperative that we connect with others – unless we connect with our students, they can’t see the passion that we have for the knowledge we’re imparting to them. So take the time to build a relationship with your students and your co-workers. Will you get as much done on planning? Probably not. Will you have the opportunity to smile or make someone else smile? It’s pretty likely. It might sound a bit like a Hallmark card, but really, relationships with others are what makes our profession worth all the blood, sweat, money and tears we pour into it. Read more about this project here, then email your entries to teachforever AT gmail DOT com. Week 37 is scheduled for next Monday, November 23rd, but at press time there is no submission to fill that slot! Last year, Texas Instruments announced they would stop updating the "We All Use Math Every Day" website, but stated that the site would remain up as an archive of all of the lesson plans that had been developed. Thank you for contacting Texas Instruments. Texas Instruments is no longer affiliated with the television series "Numb3rs". If you search for Numb3rs, you'll see that all of the old activities are still available. Unfortunately, the curriculum alignment for each episode seemingly disappeared into the abyss with the rest of the WAUMED site. Luckily, I had saved a copy of the Numb3rs Activities Curriculum Alignment document, which I am now sharing publicly on Google Docs. The PDF contains the episodes broken down by subject and specific topic, with direct links to the activities on TI's Activities Exchange. Now you might be wondering, as I was, why TI would change their minds about the WAUMED website. I realized the answer as soon as I visited the CBS Numb3rs site to find an episode guide: the show's partnership with Wolfram Research. Contest: Win a Copy of Don't Swear With Your Mouth Full! If my review of Don't Swear with Your Mouth Full! When Conventional Discipline Fails Unconventional Children and interview (parts one and two) with author Cary Chugh, Ph. D has piqued your interest, you'll definitely be interested in a contest to win a copy of the book! The contest is simple: Share your most hilarious example of unsuccessful discipline in your classroom or at home. Leave it in the comments section for this post (this is the only way to enter). The funniest one (as judged by yours truly) will receive a free copy of Don't Swear With Your Mouth Full!. There are no restrictions or requirements beyond what I said above. Contest entries are due by Saturday, November 21st at 11:59 PM CST. Good luck! Mathspig Blog - Perhaps the best blog I've seen for stories about math in the real world, in history, misused statistics, and other such triviata that are either interesting to us or useful for the classroom! How Do You Help Your Kids Become Good Adults? [@Wired: GeekDad] - This is a good discussion to have. What makes it worth it [@Hey Miss!] - A little inspiration to end your week! Nearly Quarter 2 [@Math Be Brave] - A little more inspiration in the form of overcoming challenges and rethinking your perspective on your classroom. This is part two of a two-part interview with Dr. Cary Chugh, author of Don't Swear with Your Mouth Full! When Conventional Discipline Fails Unconventional Children. Click here for part one, or here for my original review of the book. Your ideas seem to include a lot of common sense and are based on existing research--so why is it that so many parents and so-called experts get it wrong? It’s not really fair to say the older approaches to discipline were entirely wrong. It’s more accurate to say that the status quo is partially correct. I never intended to write a book in the first place. I was trying to figure out a way to make behavior plans more efficient, to “build a better mousetrap,” so to speak. Ironically, I used the same research that spawned the conventional approaches to point out the flaws contained therein. I look at my contribution to the field of behavior modification as an extension of the behavioral model, not as a replacement. I think people will read these new ideas and have a similar reaction that you did, namely, “Why didn’t we think of this before?” And it is my hope that once behavior-limited discipline becomes the new status quo, the next generation of psychologists will take my innovations even further. In the book, we're cautioned to avoid "control activities," such as assigning a chore if we're trying to make sure children learn something from discipline. Is there appropriate use for this, i.e. you made a mess so you'll help clean it up? The argument against using control tactics with children is that this mentality flies in the face of our overarching goal for them - teach them to develop self-control. My re-interpretation of basic behavioral research suggests that ending a punishment based on a predetermined length of time creates all sorts of problems for both the child and the adult. Ending a punishment after the child completes some type of corrective activity not only feeds into the child’s need for control, but also requires them to strengthen a better alternative behavior. Having a child clean up his mess is a fine first step for choosing a corrective activity, but that alone doesn’t teach the child how to use his materials any better in the future. We try to select corrective activities that fix the mess and impart a new skill. For example, if a child makes a mess with his desk supplies, that child would not be able to progress to the next activity until his work space was cleaned and he was able to practice the appropriate use of his supplies for the teacher or class. The next time, the teacher might not let the same child start his activity until he first practiced the “right way” to use his materials. How can we get teachers and schools to embrace more behavior-limited punishments? I think most traditional public school teachers are in an environment where time-limited punishments are the only way things are done. That’s true and it’s a major problem. Think about your friends who got regularly got detention in high school. They came back the next day laughing about it. And the students who didn’t get in trouble never needed detention in the first place. In other words, time-limited punishments work great for the kids who don’t really need it! However, in elementary school, teachers use behavior-limited punishments all the time without really appreciating what they’re doing. If a kindergartner runs down the hallway, rarely does that child get put in time-out or have to write his name on the board. Most teachers simply stop all of the child’s activities until he can go back to the classroom and “walk down the hallway like a big boy.” The best time to impart a new school or strengthen a better behavior is when the adult sees the unwanted behavior. There is no need to wait until tomorrow to give the child another crack at demonstrated what is expected of him. Because we didn’t really grasp the dual nature of punishments before my work in this area, teachers (and parents) didn’t understand how to make punishments more effective for older kids. Now we do and that is why I am working hard to get the word out, not just with interviews like this one, but by initiating research with schools in my area to start spreading the word! I drew a lot of parallels between your book and Teaching With Love and Logic by Jim Fay & David Funk, which I have been recommending to teachers for years. What are the differences in your approach? Again, I am prefer to look at my approach as an extension of the behavioral model. I actually like a lot of what Teaching with Love and Logic has to offer. The spirit of giving children more control over their own fate is something we share. However, like so many other good books out there, Love and Logic falls into the same traps when it comes to giving the child a consequence for their failure to comply. While they talk about giving the kids choices before a punishment is given, they offer kids no control after the punishment is given. We only punish to create motivation. So if we take a privilege away for the day, what if the child is motivated after 10 minutes without the privilege? They find their own use for the motivation, usually in the form of a meltdown. But what if they needed two days without the privilege to be properly motivated? Then they got the privilege back too soon. There is no way to predict how long a consequence has to be in effect before the child is sufficiently motivated and yet virtually every other book on the subject, even if they talk about giving the child control, advocates for these kinds of interventions that pit the child versus the adult. Don't Swear with Your Mouth Full! is unique in that it offers an approach that is completely based on basic research and makes the most efficient use of child’s new found motivation. Click here to learn about a chance to win a copy of the book! This is part one of a two-part interview with Dr. Cary Chugh, author of Don't Swear with Your Mouth Full! When Conventional Discipline Fails Unconventional Children. For my original review of the book, click here. Your book discusses why a lot of the popular and conventional wisdom on discipline doesn't work. Television has shows like Supernanny and others that seem to advocate time-limited discipline, reward charts, and all sorts of ideas that seem to run counter to the premise of your book. Are there good TV shows parents and teachers can watch for examples of your ideas at work? Any shows we should avoid? Yes – The Dog Whisperer! That’s only half a joke. Behavior modification is based on basic animal research and it is often the case that animal trainers adhere to the basic scientific principles of behavior change better than most parenting experts. Part of the reason for this is that animals don’t talk back and animals don’t evoke the same emotional reactions in their owners that difficult kids evoke in their teachers and parents. The only "expert" I tell people to run from is John Rosemond. Here's a link to my favorite example of bad parenting advice (in the second question, he advocates locking 3 year old kids in their rooms for the rest of the day when they misbehave). I often clip out his columns to show people what not to do. In some states, parents would have to jump through a lot of legal hoops to get their school to make any formal accommodations for their child, such as a behavior plan. How do we ensure schools and teachers are following behavior plans issued by parents? I think the best way to accomplish consistency across settings is for the parents and teachers to view each other as part of the same team with the same goal – to better socialize the child to the learning process and to maximize their potential. With the right mindset, we can avoid some of the typical problems that develop between parents and school personnel, such as one group blaming the other for not doing their job. In my experience, the most effective way to convince a teacher or the child’s team to try something new in the classroom is for the parents to demonstrate their own success using an alternative system at home. Parents often forget that teachers are human and are prone to the same frustration and anxiety when dealing with challenging children as they are. Good communication and good teamwork go a long way to preventing roadblocks from interfering with the child’s development. Where does the idea of children having to be completely under control of adults come from? Let’s face it - parents get trained as much as their kid do! For example, a mother who hovers over her son while completing homework gets instant gratification by getting it done more quickly. The same thing can be said for the parent who yells, threatens, or spanks. The title of my book, Don't Swear with Your Mouth Full!, is a funny example of the long-term effects of this kind of mentality. Parents get reinforced by the child’s quick response to being yelled at, but tomorrow they have to yell twice as loud while their expectations start dropping lower and lower. If theory hasn't caught up to science, as you assert in your book, what can we do to protect students from bad decisions in terms of medication, being shifted into special programs or otherwise "labeled" in and out of school? I like telling people that they will know if a particular punishment/reward scheme is working when they don’t have to keep using it. In fact, the last thing I wrote about in Don’t Swear with Your Mouth Full! is something called the Poor Man’s Evaluation. Simply put, if a child has the capacity to learn a new behavior and the teacher is using technically sound behavior modification strategies, the behavior always improves. If the behavior persists despite good interventions, then the child has demonstrated that he cannot control the behavior in question. At that point, behavior management is considered (e.g., change in classroom; formal accommodations). We try not start with behavior management tactics because if the child could learn a new behavior and we manage it, the child has no need to learn it because it is being taken care of for him. If behavior modification and behavior management fail, then we talk about the possibility of medication. It is a fool-proof way to prevent the child from experiencing unnecessary and potentially harmful treatments. As a teacher I was always concerned about how many students seemed to be mislabeled as needing special education services or given "armchair diagnoses" of ADHD. How real is this problem? How potentially dangerous is it to the development of those kids? ADHD is a very real neurodevelopmental disorder affecting approximately 3-7% of school-aged children in community samples. A thorough assessment by a trained child psychologist, very often in collaboration with the school psychologist, is paramount to the development of an effective treatment plan. In other words, we don’t just eye ball kids and take out best guess. I tell parents, “Kids can’t tell us whether they have ADHD so the adults better be pretty damn sure they do!” Failing to detect ADHD is also a major problem. Left untreated, kids with ADHD are at significantly higher risk for an array of secondary emotional, behavior, and psychosocial problems that can have devastating consequences. However, it is a major misconception that ADHD treatment always involves medication. In fact, the Poor Man’s Evaluation is used to determine the need for medication intervention. For kids with mild to moderate ADHD, behavioral interventions are equally effective as medication options. We do recommend medication as a primary intervention for kids whose symptoms are severe in nature. But, it is critical to note that most kids who go on medication continue to require more behavioral support than their classmates without ADHD. I argue that behavior-limited discipline has the potential to be far more effective than typical strategies used with kids who have ADHD. It’s interesting that while we know that these kids experience “time blindness” (i.e., they don’t learn from past mistakes and they have difficulty predicting future consequences for their actions), all of the recommended practices incorporate time limits! With behavior-limited punishments and rewards, teachers and parents can take immediate advantage of the motivation their interventions create to shape the child’s behavior. Come back tomorrow for part two of this interview! Educators know that in most U.S. schools, the most common approach to discipline is a version of detention. At the elementary level, this takes the form of time-out or staying in from recess, lunch or other activities. At the middle and high school level, the same principle is applied in the form of after-school detentions, in-school suspension, and out of school suspension. In essence, our de facto response tells students You've misbehaved, so you must leave class for this amount of time. Of course, I think most educators also know that for the most consistently challenging students, this approach usually fails to improve the student's behavior. In his book Don't Swear with Your Mouth Full! When Conventional Discipline Fails Unconventional Children, child psychologist Dr. Cary Chugh makes the case for a better way to deal with students when the most common methods fail. Dr. Chugh explains what research says we should be doing and compares it to what most parents and teachers already do. Use of methods like the example above, something the author terms time-limited discipline, is deconstructed and analyzed. He easily reveals why the idea that adults need (or will ever actually have) complete control over a child's behavior is no more than a myth. It's helpful that the author always explains what the child's perspective on everything is and how they will respond to a wide range of conventional methods. Ironically, he doesn't say that everything we do is wrong: for the most part, it's how we do it. For example, Dr. Chugh doesn't say we should throw out ideas like time-out or detention. Instead, we should remove the time limit and create a situation where the student can end their punishment if they can demonstrate the proper behavior we're seeking. He doesn't really advocate creating positive incentives either; for most of the examples he gives, the child's incentive to behave is that the punishment will end. This is a powerful idea that doesn't exist when we say something like, "You have to go to your room for the rest of the night," or "You're going to be in ISS for the next two days." The child is stuck, and whether they're ready to go back to class in ten minutes or still not ready after that time frame has ended, we haven't actually solved the problem. The author terms this alternative behavior-limited punishment, and this idea is really at the heart of the book. Other methods may work temporarily, making misbehavior more manageable. They may work great with children that rarely misbehave or get into trouble. Don't Swear with Your Mouth Full!, however, is aimed at dealing with children where the situation has gotten out of control or the child has emotional and psychological issues causing serious misbehavior. It's about repairing relationships and making real, long term positive changes in difficult situations. The book is a quick and easy read, with each chapter ending in a series of Take-Home Points that summarize the most salient and critical information. While the main audience for this book is parents, everything Dr. Chugh discusses absolutely applies to the classroom as well. He differentiates his approach for young children and teenagers. In addition, there's a chapter entitled "From Teacher's Pest to Teacher's Pet" that addresses these issues at school directly. The last chapter serves as a review and clear starting point for changing our thinking about discipline and how to apply the author's ideas at home and in the classroom. 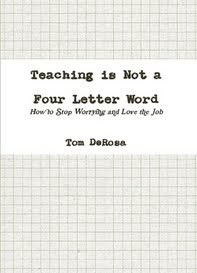 I wholeheartedly recommend this book for parent and teacher alike. It's a refreshing, well-researched and well thought out perspective on the most frustrating and pervasive issue we deal with when it comes to kids. Don't Swear with Your Mouth Full! When Conventional Discipline Fails Unconventional Children is available on Amazon.com as well as directly from Dr. Chugh's website. It's still somewhere in the back of your mind, just waiting for you to type out and email to teachforever AT gmail DOT com. Unfortunately that means there's no entry this week, which makes today a great time to catch up on previous entries. 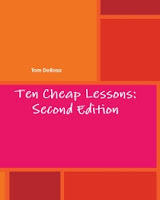 It also means that my book Ten Cheap Lessons: Second Edition is not available for free download today (but it's still only $5 to download anyway). Looking ahead, on Tuesday I'll be posting a review of the book Don't Swear with Your Mouth Full! When Conventional Discipline Fails Unconventional Children, followed by a two-part interview with the author on Wednesday and Thursday. Stay tuned! Yes, my weary friends, we're only a few short weeks away from Thanksgiving. You're in the home stretch now! You can do it! Enough With The School Projects! - Wired's GeekDad blog makes a good point about teachers giving projects that focus too much on art and creativity and not enough on content. The article, written from a parent's perpsective, offers a lot more fodder for thoughtful discussion. WatchKnow - Helping Educators Find Videos That Students Can Watch to Know More [@The Innovative Educator] - A review of an interesting new website that collects and categorizes educational videos. Online Grading: Treat-- or Trick? - Nancy Flanagan of Teacher in a Strange Land makes the case that giving parents instant online access to student grades can be either pointless or endlessly frustrating for teachers. Selections from the instructions for the 18th World Puzzle Championship [@The Number Warrior] - An interesting challenge for you or your students! Keep Swimming, Friends - Sup Teach? feels your pain as the countdown to Thanksgiving begins! Following up on yesterday's simple elementary grouping game, here's a way to use a deck of cards to do more practice on grouping in the classroom, at home, or anywhere you have some table space to lay out cards. This is appropriate for K-3, (older children having trouble with multiplication and division). Start with all 52 cards, face down. Groups of 26, 13, 8, 7, 4, 2, 52, 1. Remove 4 cards (leaving 48 cards). Groups of 12, 24, 4, 8, 6, 2, 48, 1. Remove 8 cards (leaving 40). Groups of 10, 20, 40, 1, 5, 8, 2. Remove 5 cards (leaving 35). Groups of 5, 7, 35, 1. Remove 10 cards (leaving 25). Groups of 1, 5. Remove 1 card (leaving 24). Groups of 2, 4, 6, 8, 12, 24. Remove 6 cards (leaving 18). Groups of 3, 6, 9. Remove 8 cards (leaving 10). Groups of 2, 5, 10, 1. Throughout this activity there's opportunities to ask about multiplication and division facts as well as fractions. You'll notice the number of groups and order changes in each round; that's on purpose. I didn't include any group numbers that would leave remainders, which you can of course add depending on the child's aptitude and grade level. You could replace the deck of cards with basically any other object, but cards are useful for many different types of games and I think are easier to organize and keep track of than block, beads, and other typical counting objects used in schools and at home. I can't remember exactly where I picked up this idea--I'm not sure if I participated in this game as part of professional development of some kind or if I watched a colleague use it with their class. Either way, it's a way to practice grouping with your entire class or any large group. It would be most beneficial for grades K-2. You will be calling out numbers. Your students then get into groups of that number. They can hold hands or at least hold each other by the arm (set your expectation for this ahead of time). They must get into their groups quickly and correctly. If their group has the wrong number, or an odd number of students are left out because of the numbers you gave, they're out. Continue playing until you're down to a group of two. These are the winners, and if you think they're up to it, they can be the ones calling the numbers for the next round. Before the game, have students could the number of students in the class. As you play, have students count the number of groups you've made and how many are left over. When you repeat numbers, briefly discuss why the number of groups might have changed. For example, if you used 3 when you had 18 students, then 3 again when there were 12 students left, this is a good opportunity to wonder aloud why there are only 4 groups of 3 left. I realize that your very young students might not respond well to being "out" of the game, especially if they are having trouble socially. Having multiple rounds of the game is one way to avoid this, but you also don't want only friends grouping with each other. To add a team-building, socializing element to the game, you have to encourage students to try to make groups with everybody in the class at some point in the game. I also remember during my time playing the game, that the groups started small and then got bigger, requiring the addition of different students to each one. I'm not an elementary expert by any means, however, so any suggestions to this end would be greatly appreciated. Grouping is an essential skill for both multiplication and division, but also for adding and subtracting, fractions, percents, decimals, and even combining like terms in algebra. You can supplement this activity with anything that asks questions like "How many groups of __ can you make?" Come back tomorrow for a follow up grouping activity using a deck of cards! educarnival v2, Issue 11 is up at I'm a Dreamer. Enjoy the carnival, then submit your links for the next one! Here's a quick, easy number sense activity you can do in the classroom or at home. All you need is a deck of cards. Your student might not be able to fill the entire framework because the cards are drawn randomly, but that's the nature of the activity. Encourage them to use as many cards as possible. You can repeat this as long as your student is willing to do it. Even better, you can adjust both the equations and the rules to practice different types of problems. For example, you have to decide what to do about the ace and face cards. I would suggest making the ace a one and the face cards all equal to 10. You can have all of the cards be positive, or make black cards positive and red cards negative. You can increase or decrease both the amount of cards and equations you ask them to fill in. You can also change the type of problem (add multiplication or division). Here's a much more challenging version of this activity: Increase the square to 25 cards, but create a framework of three addition equations with fractions. Your student has to use the cards to fill in both the numerator and denominator, and while they might take the easy road and use a common denominator, some students will take the challenge of making correct equations without them.